On March 18, Drake released his new album More Life. The majority of the songs on this album are not typical rap songs that would pump you up. I mean of course everyone is entitled to what pumps them up, but this is more of a soft spoken album in which he sings. Drake announced this album as a nod to his October hit Fake Love. This personally was not for me, I really like his songs that get me pumped or are fun to dance to with your friends. The song on this album that did that for me was Portland, and it was not even Drake’s verses that I enjoyed. Quavo was featured on this track, and he is very repetitive with some very interesting choice words, but if you are looking for something fun in the car I recommend this song due to Quavo. 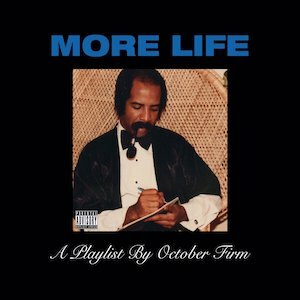 Drake himself actually refers to this album as a “playlist,” and a lot of people believe that he refers to it as a playlist because he gets on such a deep personal level in this tracks. That statistic that I have read from a couple of sources really does not make sense to me. Overall, this album does not do it for me. I really appreciate the lyrics of a lot of these songs, but I really only liked another song besides Portland, and that is Free Smoke. Both of those songs are more bassy rap songs. In the end, I give it 2.5/5 stars.